We all know that the real friends in our lives are the ones who make live so much sweater, so I needed a card with exactly that messages for a good friend. 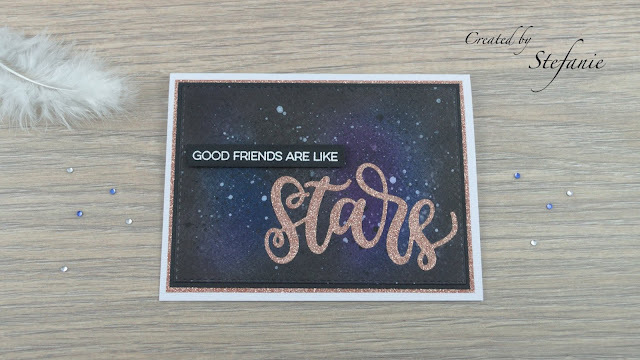 I just got the "Written in the Stars" stamp set from My Favorite Things and thought it was perfect for a friendship card. I made (yet) another galaxy backgrounds with my Distress Inks (black, faded jeans, chipped sapphire, seedless preserves and dusty concord). 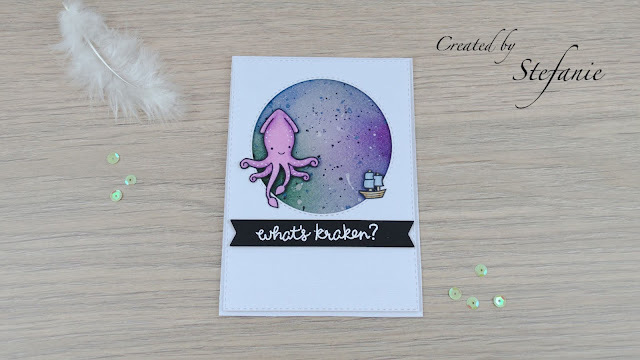 The mini ones are fantastic, I got so many colours now, for all different kinds of combinations. I sprinkled a bit of water and black and white acrylic paint on it for some more dramatic galaxy effects. Last Christmas, I found some coppery-ish glitter wrapping paper in our local super market and used this as design paper for the stars die (it is the fitting die from MFT stamp set mentioned above) and the last layer. With the paper, it has some extra sparkle, perfect for the Simon Says Challenge. The sentiment is heat embossed on a black card stock and pooped up with a few dimensionals. The inside I left blank and only added the sentiment "You don't always see them, but you know they're always there". Furthermore, I enter the anything goes Challenge from Addicted to Stamps, Love to Craft and Crafters Castle. What a lovely card and sentiment, Stefanie. The glittery die-cut "stars" looks great against the starry background. Thanks so much for joining our ATSM Challenge this week. Wow! How resourceful you are in creating this card from things like wrapping paper! I love the end result and that background is truly galaxy-level gorgeous! Great job and thank you for taking the time to share your skills with us for this week's Simon Says Stamp Monday Challenge!